Photos and videos that appear on the Cedar Springs Public Library website, Facebook and promotional materials may be gathered from public programs, events, and library spaces. 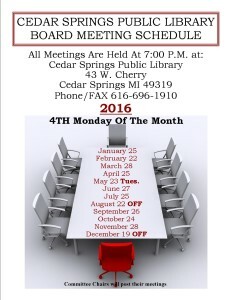 Attendance at Cedar Springs Public Library programs, events, or library spaces constitutes consent to be photographed for use in print and/or electronic publicity for the Cedar Springs Public Library. Photos, images, and videos submitted by users for online galleries or contests may also be used by the Library for promotional purposes. To ensure the privacy of individuals and children, images will not be identified using full names or personal identifying information without written approval from the photographed subject, parent, or legal guardian. If you do not want us to use a photo or video of you or your child, please tell the Library staff member coordinating the event PRIOR to the program.